With Le Nuvole line, founded in 1996, Maurizio Tombari would like to offer a fine artisanal product, coupled with the perfection of the execution and a personal and innovative formal research. This is done by melding long experience matured in the Pesarese workshops with the "uncontaminated" creative vision of his wife, Stefania, his partner for the stylistic designs. Ambitious conductor theme "Ambizioso tema conduttore": joining functionality and elegance. 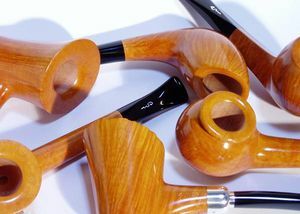 A particular concession to the fantasy of the shapes and a digression from rationality, is reserved for the ZED line of pipes, an exiguous series of exclusive and numbered models. Maurizio produces 230 pieces per year; each piece is realized with the same meticulousness and care of details. 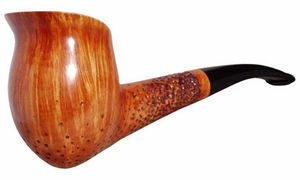 The ageing of at least 3 years of the briar (from Calabria and Tuscany), stored in an insulated room, plays a vital role in the smokability and the 'flavour' of the pipes. The special processing and finishing of the methacrylate(acrylic) mouthpieces ensures a perfect "suitability" of the pipe. Maurizio Tombari was born in Pesaro in 1953 and received a diploma in painting at Accademia di Belle Arti in Urbino in 1978. 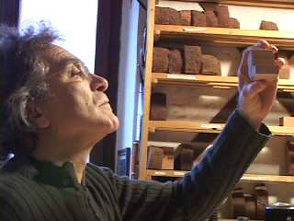 Since then until 1996 he worked for pipe makers Mastro de Paja and Ser Jacopo. At the same time, he was an interior designer and he took part in painting exibitions. 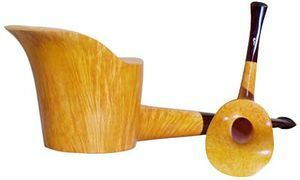 "I’ve always loved sandblasted pipes, I renounced to produce them for nine years waiting for the moment I'd owned my personal blasting machine which allowed me to have the control of all the sandblasting phases. 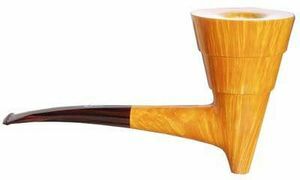 Three months ago I've finally been able to find & buy a little , but valid blast machine, and today I'm happy & proud to update my site with my first seven sandblasted pipes, finished only with natural colors and shellac. I've introduced a new group of merit in my grading system: Group S which, with its subgroups 1, 2, 3, identifies my sandblasted Le Nuvole." ... some sold before midnight! See also a Conversation With A Conversation With Maurizio Tombari. This page was last edited on 2 April 2008, at 07:42.